Flexible and effective backup of MySQL, MS SQL, PostgreSQL and other databases. Dear friends! We have released the new version of Handy Backup with enhanced functionality for backing up popular databases. The update has been applied also to online backup modules of the program. The version 7.4 is mainly dedicated to facilitate the backup of MySQL, MS SQL and PostgreSQL databases that is considered to be troublesome and time-consuming for an average user. Moreover, we have improved features concerned with saving copies to cloud - backup to Yandex.Disk and to HBDrive online storage become more convenient. Being one of the most popular databases, PostgreSQL is now available for backup and recovery with the help of the new plug-in. You can set up a schedule for automatic backup of the database. The program allows you to copy PostgreSQL databases without stopping working process due to the hot backup technology. The enhanced MySQL functionality supports an opportunity to choose whether or not to allow other users to make changes in database tables during a backup process. We have made the recovery of MS SQL databases faster and more resource-saving by adding an opportunity to stop for restoration only required objects instead of the whole instance. All listed features of MS SQL, MySQL and PostgreSQL backup are available in Small Server and Network Server editions or can be included in any other version by purchasing of the separate plug-ins. We have also amended the system of notifications to simplify the interaction with the program: you will get clear explanation of any error during backup or recovery process inside the wizard and by a message on your e-mail. Download the new version and enjoy the advanced software for database backup and recovery! 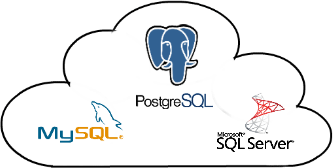 PostgreSQL - one of the most popular and reliable open source databases. Many indidvidual programmers and successful companies prefer PostgreSQL over other systems of data management. MySQL - you can create non-blocking snapshots of individual tables or complete databases without interrupting SQL queries and transactions.